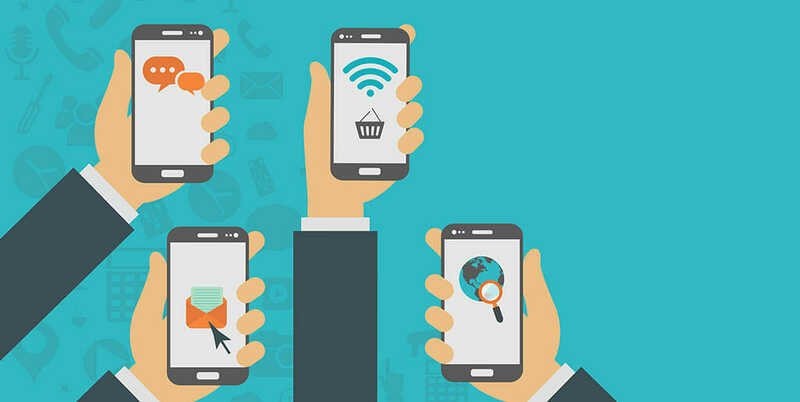 Want to stay ahead of your competition in the mobile experience department? The best way to do that is to understand current and emerging trends. Will the mobile app development world shift towards mobile payments? What type of market penetration will there be in healthcare sector for mobile and smart devices? Is it a good time to create an augmented reality mobile app? Or, should you be focused on infusing your software with artificial intelligence (AI)? Or, is there some other technology to explore? These are questions that keep mobile-focused professionals up at night. To help you in this regard, I’ve rounded up the latest and most relevant stats and facts about mobile app development. Nearly 2.1 billion consumers worldwide will be using mobile wallets to make payments or send money by the year 2019. This shows a 30% increase from 1.6 billion, which was recorded in 2017. Statistics show a gradual rise in Peer to peer and mobile in-person payments from the year 2014 through 2018. In 2017, In-person mobile payments stood at 16.240 billion US dollars and arose to $23.47 million. By 2019, this amount is expected to rise to $34.160 million. A great time for businesses to start accepting mobile payments because nearly 66 % of people surveyed believe smart phones will replace conventional payment methods like credit cards and cash by the year 2020. In US, the in store mobile payment boom seems to be steadily advancing by 40%, garnering a CAGR of $1.28 billion by 2020. Rising from just $6.6 billion, mobile point-of-sale revenues are expected to rise to $50 billion by 2021, causing a ripple effect in increase the number of such devices that account for 1 in 3 point-of-sale terminals. 50% of all surveyed American retailers were found in favor of having NFC (Near Field Communication) technology or were already using it in their stores for payment. Contactless payments have been on the rise ever since Apple Pay was released this year. A study by Strategy Analytics reveals that payments made through NFC-enabled mobile phones are set to surpass $130 billion of consumer retail worldwide by the year 2020. The number of users who tap to pay using a contactless payment solutions will grow to 450 million people worldwide by 2020. This is according to a research by Juniper, forecasting that mobile payment solutions like Apple Pay, Samsung Pay, Google Pay, and others will considerably dominate how people pay for services. Out of all of these, Apple is expected to amass the largest audience, with 1 in 2 of the “OEM Pay” users globally. A Girl Scouts council enjoyed an increase in sales of 13 %, by the troops using mobile payments. The per-girl box sold average increased from 156 boxes to 177 boxes when they opted to use mobile payment instead of cash or credit. In 2017, the mobile health market reached $21 billion, worldwide. By the year 2020 it is expected to reach $206 billion. Mobile and wireless health market will be two major reasons for such a huge difference in numbers. By the year 2019, the global market for wearable devices in the health sector will amount to approximately $4.4 billion. 93% of physicians use mobile health technology as part of their daily activities. While 80% healthcare professionals use it in providing patient care. An estimated 1 in 4 of the medical practitioners have EHR systems that record clinical information from various mobile phones, and 36% of these allow their patients to access information and health records using a mobile device. There are around 247 million people in the US and these stats suggest that everyone has downloaded a healthcare app for personal use. While there are more or less 40,000 apps available for use by patients, consider the market gap with a user base of 247 million people. By 2017, 65 % of nurses were using mobile devices at a patient’s bedside to give better patient care. By the year 2022, this number is expected to cross a percentage of 97%, projecting the number of nurses using mobile devices to improve healthcare services for their patients. In an article by The Economist, mobile health solutions will enjoy continued development as the big sharks in the sea of investors show a bloodthirst for startups offering such solutions. A good time to jump in the mobile health sector. By the year 2022, Chat-bots could help cut down annual business costs by a giant $8 billion figure. As predicted by a new research, anticipating an increase in the number of automated customer service programs employed by companies, as they embrace the power of Artificial Intelligence (AI). A study by Gartner suggests that, touching the year 2020, 85% of customer interaction with enterprises will be handled without a human. An interesting breakdown of these people shows that 39% of these use voice assistants in their homes, 51% use them while driving their car, 1.3% use them voice assistants at work and 6% use them in public. The analysts, Roberta Cozza and Annette Zimmerman, over at Gartner suggested quite a few things to look for in this year’s mobile world congress. Among other things, they suggested Artificial Intelligence to take the center stage. Of all the enterprises going AI, 83% of early AI adopters reported substantial (30%) or moderate (53%) economic benefits. Gartner predicts that in the year 2020, almost all new software products will come with Artificial Intelligence. In 2017, the term ‘artificial intelligence’ was very popular, ranking on number 7. Gartner forecasts that by 2020, more than 30% of CIOs will consider Artificial Intelligence a top five investment priority for their business. Augmented Reality is continually to show why it will supplant VR as the more relevant emerging technology. Google is expecting all Android smartphones to be AR compatible. If you thought AR would never grow beyond a niche technology for nerds, think again! AR/VR are sister fields progressing handsomely. In 2016, the combine worldwide market size was $6.1 billion, In 2017 it doubled to $14.1 billion and by 2018 it increased to $27 billion. Basing on the rising trajectory, by 2022, it is expected that augmented and virtual reality will reach a market size of $209.2 billion. Talk about the promising market of smart augmented reality glasses. Mobile apps with an AR kick will surely pay off better, because by the year 2022, the number of smart AR glasses sold is expected to reach 22.8 million units. It’s a great time to begin building an augmented reality application. Augmented Reality has had paramount success so far, but it isn’t stopping there. The big guns are preparing to release new AR tech soon, notably the fabled Magic Leap smart AR glasses. We should expect them to hit the market in 2018. 2018 will be big for AR, but 2021 will likely be much bigger! AR smartglasses are expected to reach a 3.5 billion installed base and garner $85 billion in revenue within 5 years. Mobile AR is also growing into a giant with these exciting AR platforms like Apple ARKit, Google ARCore, Facebook Camera Effects, and Snap Lens Studio. 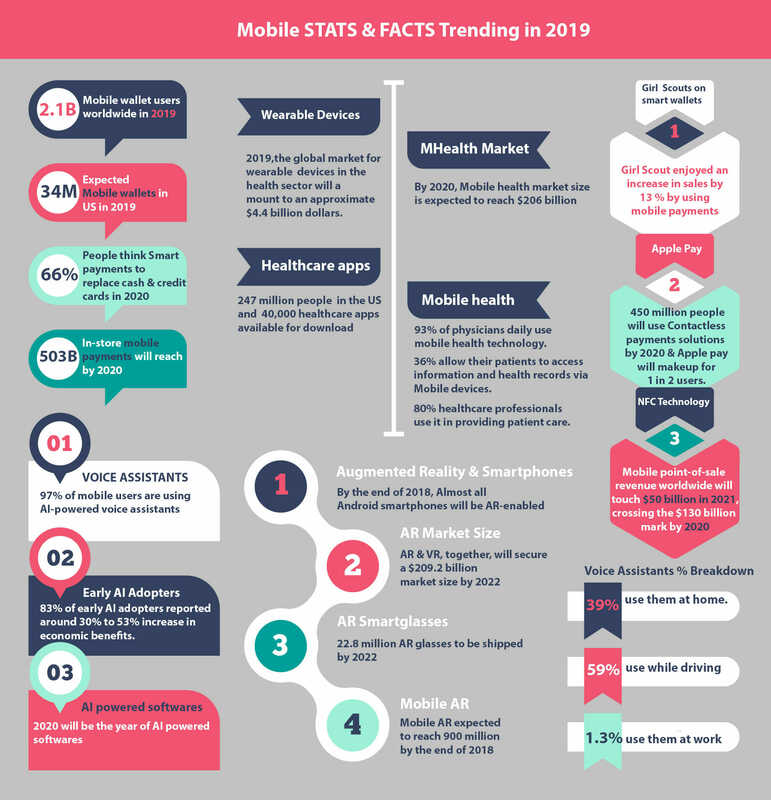 Want to know how to turn these facts and trends into an actionable plan to create or update your business’ mobile app? We invite you to contact CitrusBits for a free consultation.